Brewers and distillers can now craft their products from grains grown and malted in Ontario, traceable to the individual grain grower. 720 kg batches are processed through germination with precise computer control, ensuring reproducible results batch to batch. All grain transfers use pneumatic (air) equipment, virtually eliminating cracked kernels. Vessels are scrupulously cleaned after each batch to minimize contamination. Ontario’s first micro-maltery is located on the Southwest corner of Guelph. The first product is a pale malt made with Newdale barley, one of the top ten brewers’ choice malts for the last few years. Malt can be delivered in 25 kg bags, or, environmentally responsible returnable tote bins. Custom roasting is available, as are malted rye, wheat, and other grains. Only high quality grains will be malted to ensure a consistent, high extract product. Standard testing will be performed to ensure each batch will perform as promised, and all products will be examined for foreign materials and toxins. Pale barley malt: English style ale malt, 80% minimum extract. Beyond the Pale barley malt: Stewed and roasted to provide 40-60 Lovibond. Converts like the Pale. Rye malt: Yields the full rye grain spiciness. Wheat malt: Ontario soft winter wheat for low protein and classic flavour. 2018 was a particularly poor year for malting barley grown in Ontario. 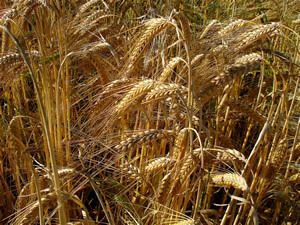 Very few crop submissions were acceptable for malting, and there were limited quantities available. Barn Owl Malting located a large quantity of usable Newdale barley in E. Ontario, and was kind enough to share the barley with Harvest Hop + Malt. HH+M now has enough barley in hand until 2019 harvest. 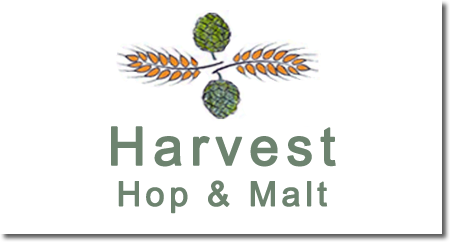 Harvest Hop & Malt needs high quality grains to produce the best malt possible. Prospective growers need to agree to the following specification. Please contact HH&M with any questions. Malting is a process of germinating the barley to allow its own enzymes to be available to the brewer for conversion of seed starches to fermentable sugars. The barley needs to rest under controlled conditions (see below), for at least 8 weeks to allow the seeds to cycle through dormancy and be at their optimum level for uniform germination. Only two-row malting barley will be accepted. Newdale is recommended, but other two-row varieties may be acceptable, subject to submission of their malting profiles, before planting. The key spec for malting barley is a minimum 95% germination rate. Germination rates under 95% may be improved by screening to remove undersize seed that will not germinate, at Grower’s cost. The barley will be received as cleaned, having removed foreign seeds, broken barley seeds, stones and dirt. Each batch of crops will be tested for germination rate, protein content (11% to 12.5%), and presence of the DON vomitoxin (< 1 ppm, ideally 0 ppm), prior to accepting for malting. Shipments will be accepted in 720 kg totes (preferred), or 25 kg bags. Bags or totes must have a cardboard sheet between them and the skid to prevent bag damage. Evidence of pre-sprouting, weed staining, insect infestation, fungus or mould will reject the load. Shipments will be pre-scheduled, following testing of a 1 lb sample to be sent at Grower’s expense. The 1 lb sample should be taken after seed cleaning and drying, assembled from multiple samples covering the total acreage harvested. HHM will sieve the sample through 6/64 in., 5.5/64 in. and 5/64 in. slotted screens. 80% or more of the sample should be retained on the 6/64 screen, and no more than 2% should pass the 5/64 screen. Stored barley, pre-shipment, should be at 12 - 14% moisture in a location protected from vermin. Moisture content above 14% will be cause for rejection. All totes shall be examined for cleanliness, and sieved for sizing. If the barley is out of specification, the tote will be rejected, or cleaned, at HH&M’s discretion, and at the Grower’s cost. If a tote is damaged to the extent that plastic fibres are mixed within the grain, the load will be refused.